ANN WALLACE came to Madison as a UW-Madison freshman and, except for a year on each coast, she has lived here ever since. After completing her bachelor’s degree in sociology, she worked in the UW’s sociology department on a series of research and training projects until 1980 when she moved to the Dean’s Office in the School of Education. 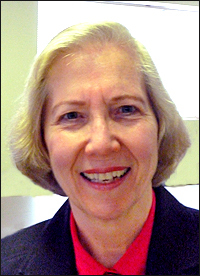 There she progressed through several administrative titles, retiring as an Assistant Dean in 2005. Complementing her job responsibilities relating to academic staff, she was active in academic staff governance on campus from its beginning in the late 1980's. Since retirement, she has been the volunteer executive director of the UW-Madison Retirement Association. When not working with or for retirees, she enjoys concerts by the Madison Symphony Orchestra and School of Music faculty, organ recitals at Overture Hall, operas downtown and on campus, and dining out as a way to stay in touch with friends.